We are pleased that we have now have received the go ahead from WDDC for our designated Neighbourhood Plan Area and the approval letter will shortly be available on the YRIPC Parish website under the NP pages. As well as approving our area submission we have been nominated a WDDC support officer to help us produce our Plan and we have now had our initial meeting with him. We have also now made our application for the financial grant aid that is available to help us with the next phase of the project. Additionally we have been advised that we will need to consider a Strategic Environmental Assessment (SEA) for our Plan and that we should seek advice with regard to this at an early stage. Again we have met with WDDC’s Environmental Assessment Officer to discuss our options. We have set up a Steering Group which has now met 6 times and you will hopefully have attended one of the recent Community Meetings. These were based around geographical areas within the parish and gave people the opportunity to give their views as to how they see the parish developing in the form of amenity, business, housing and the environment etc. We are aware that we have recently completed the Parish Plan process and that information is available from this. However, the Community Meetings are seen as a way of building on this original work in a positive way and will enable us to produce our “Vision” of the future for the next 10 – 15 years together with Options and Objectives to guide our Neighbourhood Plan Policies and Proposals. We hope to start work on this in December. Importantly we are endeavouring to establish a background of village development and statistics regarding the parish population with a view to eventually developing a view on the overall sustainable development principles of the Parish and how our Plan can contribute to these. We have produced terms of reference for the Neighbourhood Plan Group and also for the Steering Group so as to “formalise” our arrangements and again these will shortly be available on the web site. 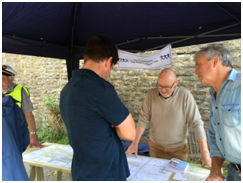 Hopefully you managed to drop into the NP Stall at the Yetminster Fair and which was kept busy throughout the afternoon and was thought to have been a worthwhile exercise – our thanks to those who volunteered to help with this. Our volunteers hard at work on the NP stall on Yertminster Fair Day! Thought is now being given to having some form of display that could be used at Village Hall functions to continue to promote our efforts. It is also recognised that it is important to keep a central record of progress and consultations for submission with any final documentation in order to show the involvement with the Community. Something else we are keen to do is to engage with the children in some way to explore their “visions” for their future. A way to do this would be to get them to design an NP Logo to replace our present linked hands graphic. We also need to engage with younger members of the community and we are looking at ways to do this – a Facebook page and a “user friendly ” stand alone Neighbourhood Plan website are proposed. As well as the Community Consultations we are asking, initially through the pages of the WVM, for a “Call for Land” the intention being that local landowners can register their interest and ideas for development. We then propose a series of meetings or presentations so that their proposals can be explored with a view to submitting them to the community in some form of “Open Day” although this is all very much at the planning stage. • identify good and bad examples and the underlying principles that should apply. • establish present use of school, pub etc. The first 3 areas (data gathering, mapping and support) are principally those of administration but are obviously essential if the Neighbourhood Planning process is to be successful. Whilst these areas and activities may change and develop with the feedback from the consultation process and the “call for land” it is felt that they will provide an initial basis with which to work.